There were other similarities between the two men. Like Mr. Lincoln, Stevens lost a parent early in life. Like Mr. Lincoln, he had a pious and revered mother. Like Mr. Lincoln, Stevens supported the Second National Bank. Like Mr. Lincoln, he had a particular concern for the powerless. Like Mr. Lincoln, he was deprived of a presidential appointment he thought he deserved. Like Mr. Lincoln, he was several times denied the Senate seat he craved. Like Mr. Lincoln, he was a gifted politician. Stevens, however, used his gifts primarily as a floor manager of legislation. But there was a major difference in their temperaments. 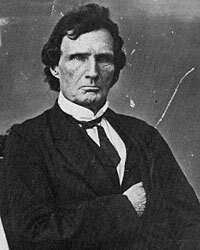 Thad Stevens, according to historian Donald Barr Chidsey, “was an island of ill-nature in a monotonous expanse of professional amiability; like [Roscoe] Conkling he didn’t ask that anybody like him, or even admire him, but he demanded that his associates fear and obey him — and they did.”3Unlike Mr. Lincoln, Stevens never lost his taste for invective. Throughout his life, he seemed embittered by failure to achieve the preeminence he thought he deserved. His zealous and nasty disposition won him many enemies. He was born with a club foot and later suffered an attack of “brain fever” that left him bald and in need of a wig. Bitterly sarcastic, quarrelsome and vindictive, inclined always to opposition, he was also personally generous. He strayed from his mother’s religious habits but remained a proselytizing teetotaler (although he occasionally indulged himself). His vice was gambling — which was his evening recreation. He also gambled in politics — putting everything he could on the politician he backed. His other loves were riding and reading and the Caledonia Iron Works, which he owned. 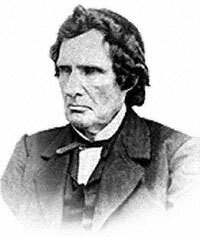 Thaddeus Stevens was born in Vermont in 1792 — one of four sons. His father was an alcoholic who eventually abandoned the family. His mother, a pious Baptist, wanted her son to become a minister. Stevens went to Dartmouth College from which he was expelled, attended Burlington College, and eventually returned to Dartmouth. He taught briefly and read law before moving to Gettysburg, Pennsylvania in 1816. His local notoriety and subsequent good fortune stemmed from a successful insanity defense of a farmhand who used scythe to detach the head of a fellow worker. With the profits from his legal business, he invested in real estate (which he often picked up at sheriff’s sales) and provided the venture capital for a charcoal-iron furnace. Although his nickname was later the “Great Commoner,” as an attorney and legislator, he frequently found opportunities to help favored bankers and businessmen — and consistently favored the high tariff that Pennsylvania businesses required. In order to preserve the economic privileges of himself and his friends, he became chairman of the Canal Commissioners so that he could use that position to collect funds for Governor [Joseph] Ritner’s reelection. He spent money liberally and unsuccessfully tried to manipulate the results to Ritner’s advantage. The Democratic victory resulted in a Democratic investigation of Stevens’ election chicanery. An allegation of paternity outside marriage led to his dismissal from the House. Stevens entered politics as an anti-Mason (after rejecting a proposed political collaboration by future President James Buchanan). His opposition to secret societies perhaps reflected his rejection by Phi Beta Kappa at Dartmouth, his aggravation with any form of elitism, and the Masons’ prohibition against membership by “cripples.” He was elected to his first of seven terms in the Pennsylvania Legislature in 1832 and quickly became a proponent of public education. He coalesced with the Whigs in 1835 to elect Whig Joseph Ritner as Governor. As a leader of the Pennsylvania House, he helped recharter the Bank of the United States through political techniques that appear to have involved buying certain members. Like Mr. Lincoln, Stevens used his legislative position to agitate for internal improvements — but in his case they were very specific improvements which involved the extension of railroad routes to Gettysburg to service his perpetually unprofitable iron works (first the Maria Furnace and later the Caledonia Furnace). After 1836, he switched his political target from Masons to slaveholders. He rose to legendary political stature by organizing the Whigs and anti-Masons at the 1837 Constitutional Convention although he did not accomplish what he might have had his attentions been focused. Stevens worked hard for the election of William Henry Harrison in 1840, but was denied a promised appointment to the Cabinet. (He was a persistent opponent of the Clay faction of the Whigs.) In 1842, he left Gettysburg for Lancaster’s better business opportunities and to finance the debts on his iron works, but Lancaster’s Whigs were never thrilled by his emigration to their city. After boosting Winfield Scott for President in 1848, Stevens ran for Congress and won. He quarreled with Sen. James Cooper, the Whig who was elected to the Pennsylvania Senate seat Stevens himself coveted. He served in Congress without particular distinction until 1854 when he declined to seek reelection to the House. At 66 in 1858, he was once again elected to Congress. At a time when most men are retiring from active life, he began his most influential political phase. He backed Judge John McLean at the 1860 Chicago Republican convention, sought reelection but set his political sights again on a Senate seat. He failed in thatand his effort to replace Simon Cameron as Pennsylvania’s man in the Cabinet. 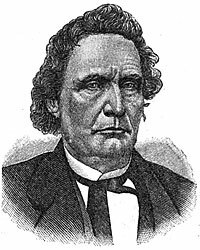 His greatest political success was the election in December 1861 of his Pennsylvania ally, Galusha Grow, as speaker of the House of Representatives. Stevens could be an astute politician, but he could also waste his energies on unimportant fights. He became embroiled in personal disputes with other members of Congress, including with erstwhile ally Elihu Washburne over an appropriation for a canal. Stevens blocked the pork barrel project. Washburne had his opportunity for retribution when Grow was defeated for reelection in 1862 and Schuyler Colfax was elected speaker. Colfax offered Washburne the Ways and Means chairmanship, but the Illinois Congressman declined in deference to Stevens. As chairman of the House Ways and Means Committee, he was the effective leader of the House and a constant thorn in the side of Secretary of the Treasury Chase on financing the nation’s war debt. He was a proponent of District of Columbia emancipation and use of black soldiers, but he lost many battles — even over matters controlled by his own committee. He thought Mr. Lincoln legally wrong in his April 19, 1861 “blockade” of Southern ports, arguing that the authorization of the cities as ports of entry should simply have been revoked. Lincoln’s actions, he felt, recognized the Confederacy as a separate nation. Given that presidential faux pas, Stevens felt all restrictions on punitive Union action toward the South were removed. Ralph Korngold, Thaddeus Stevens, p. 44. Alexander K. McClure, Lincoln and Men of War-Times, p. 277-278. Donald Barr Chidsey, The Gentleman from New York: A Life of Roscoe Conkling, p. 1, 4-5. Hans. L. Trefousse, Thaddeus Stevens: Nineteenth-Century Egalitarian, p. 89. Alexander K. McClure, Lincoln and Men of War-Times, p. 280-281. Fawn M. Brodie, Thaddeus Stevens: Scourge of the South, p. 159. Allan Nevins, The War for the Union: War Becomes Revolution, 1862-1863, p. 340-341. Fawn M. Brodie, Thaddeus Stevens: Scourge of the South, p. 155. George H. Mayer, The Republican Party, 1854-1964, p. 112-113. Samuel W. McCall, Thaddeus Stevens, p. 216. Fawn M. Brodie, Thaddeus Stevens: Scourge of the South, p. 154. Samuel W. McCall, Thaddeus Stevens, p. 216-217. Alexander K. S., Lincoln and Men of War-Times, p. 284-285. Ralph Korngold, Thaddeus Stevens: A Being Darkly Wise and Rudely Great, p. 224. Ralph Korngold, Thaddeus Stevens: A Being Darkly Wise and Rudely Great, p. 224-225. Hans. L. Trefousse, Thaddeus Stevens: Nineteenth-Century Egalitarian, p. 202. Alexander K. McClure, Lincoln and Men of War-Times, p. 126. Fawn M. Brodie, Thaddeus Stevens: Scourge of the South, .